Taking care of a fence around your home is a nuisance, but taking care of one that surrounds pasture land or other large properties can be a nightmare requiring either a lot of time or a lot of herbicide. The Wright fence mower takes the effort out of this job by using a low-profile deck that slips under the fence and moves away from posts automatically. Since it’s entirely mechanical, the mower can attach to almost any tractor. 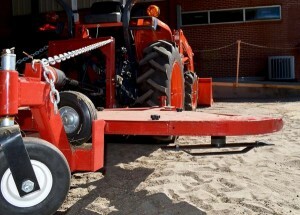 The mower mounts to the tractor using a standard three-point hitch. The minimum height is set using spacers on the trailing wheels; Wright recommends a two-inch cutting height for most areas. The deck is pushed out toward the right side of the tractor by a swing arm. The outer edge of the deck shell has a tapered nose with a bumper bar. As the mower pushes into the post, the pressure on the bar makes the swingarm retract, pulling the deck out of the way. As soon as the post has passed, the pressure on the swingarm is released, pushing the deck back out. This mechanism lets the mower cut within ½ inch of each fence post. The effort needed to move the deck is very low so it won’t damage metal or wooden posts. What Fences can I Use it On? Wright recommends using the mower with fences that have a bottom wire or board that is no less than 7 inches above the ground. The swingarm mechanism works on posts of any diameter or material. These models come fitted from the factory with a grass blade like you’d find on any lawnmower. Wright also offers a brush removal blade for heavy vegetation and small saplings up to 1 ½ inches in diameter. In some cases, a tree that is thin enough to be cut by the blade will still activate the swingarm. If this happens, the operator can back over the tree to keep the deck from moving. The mower is built on a steel tube frame and uses ¼ inch plate steel for the deck walls, making it as tough as any deck you’d find on a top quality professional mower. Will the Fence Mower Fit My Tractor? 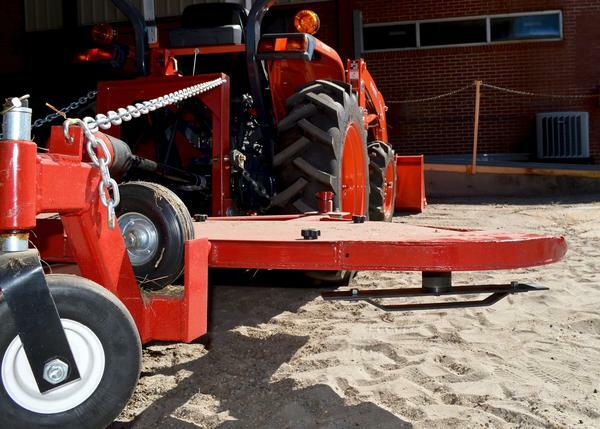 Wright makes two versions of their fence mower: the FM30 is designed for tractors that have a wheelbase that’s 48-66 inches wide, while the FM60 extends further so it can be used with tractors that are 68-92 inches wide. The mower deck is designed to work on any tractor operating in low gear. Both models use a swingarm that moves up to 22 inches, cutting 11 inches of grass on each side of the fence. The distance the mower needs to be to get an even cut will depend on its width. Both models use a cast iron gearbox rated for 40 hp. Is the Wright Fence Mower Right for My Needs? If you’re looking to get a fence mower for your tractor, or you need parts or service for your current mower, visit Shank’s Lawn Equipment. We have over three decades of experience with outdoor equipment, so we know how to get the best setup for your tractor. Stop by our shop, located at 4900 Molly Pitcher Highway in Chambersburg, PA. To get here from I-81, take Exit 10 to Marion and drive East one mile. We can also ship the parts you need for your Wright fence mower to any location in the U.S. or Canada. To order, visit us at www.shankslawn.com. This entry was posted in Uncategorized and tagged Fence Mower, Shank's Lawn, Wright Fence Mowers. Bookmark the permalink.